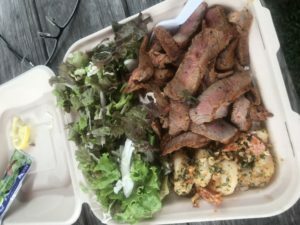 Who knew some of the best food on the Big Island was a food truck in Naalehu? The fellow sitting in front of us on our flight from Phoenix to Kona over was telling his seatmates about this place. We had 5 hours to kill after checking out of the hotel and waiting for our plane, so an excursion south seemed like a fun adventure. The normal Hawaii intermittent rain fell as we navigated the twists and turns along the 35 mph stretches to get there, but, what the heck….this was an adventure! Naalehu is the closest town to the southernmost point in the United States: Ka Lae, also known as South Point. Did you know this piece of trivia? South Point also is the starting point of a 5-mile hike to a fabulous green sand beach, but that’s a post for another time. Naalehu is a bit past the South Point turnoff coming from Kona on Highway 11 also known as the Mamalahoa Highway. 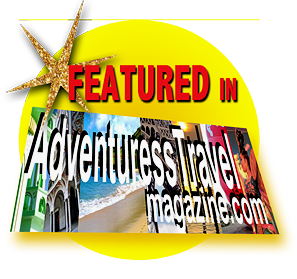 It’s on the way to Volcanos National Park, so you can plan to stop there for lunch if you are traveling this way. 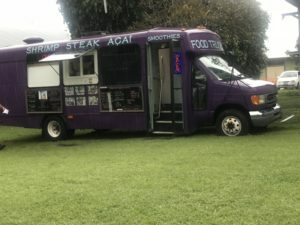 There is a bakery (which I hear is also worth checking out, although we didn’t), The Punaluu Bake Shop and Visitor Center, which has large signs and right across the street is the purple Aloha Mix Food Truck, sitting on a large patch of lawn with picnic tables. There’s no parking right there but a park to the south and shopping center to the north offer close access. Amazing smoothies, kombucha, açai bowls, shrimp and steak are the mainstays here. Their surf and turf is customized with your choice of lava shrimp, lemon pepper shrimp, or garlic butter shrimp or a get them all! Combine this with either sirloin or new york steak. It is accompanied by a large serving of rice and a fresh, crisp salad. The freshness of the ingredients and subsequent taste were the highest quality! If you’d rather, açai bowls with the freshest, locally sourced ingredients will hit the spot. Priced affordably, you’ll leave here with a full tummy and a big smile!